Sitting on an inclined bench (no more than 60° because you don’t want to work only your deltoids) with your elbows bent. You have a dumbbell in each hand with a pronated grip. This exercise mainly works the upper part of pectoralis major (upper chest) and a little bit anterior deltoid, seratus anterior and pectoralis minor. Seratus anterior and pectoralis minor stabilize the scapulae, allowing the arm to work with the torso. 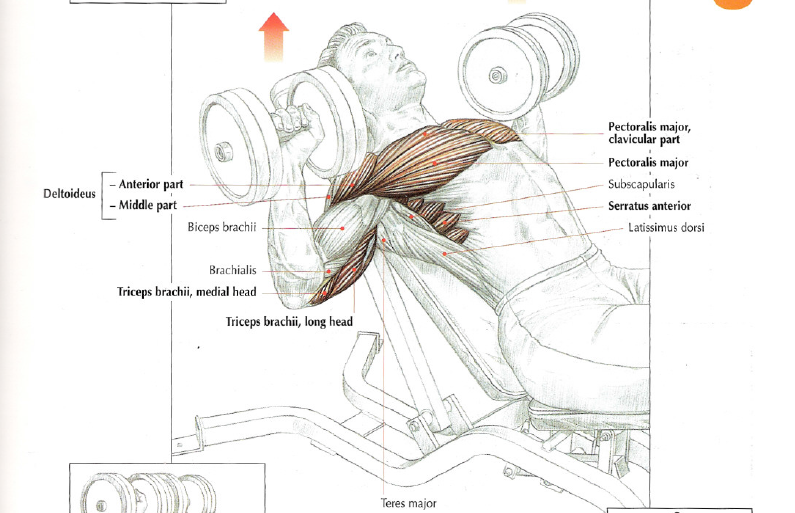 Triceps work less intensely that with barbell. This exercise is between incline barbell press and dumbbell flys. It’s a movement which works the upper part of the pectoralis major and it also stretches the muscle because of the amplitude of the movement. You can have a starting position with a pronated grip and when you extend your arms, you rotate so that your palms of your hands are face to face (neutral position). This iss really interesting, You’re an overly skilled blogger. am browsing this website dailly and get goodd facts from here daily.